The suitable hotel for your stay in Ancona!! Search among the offers the best one for your needs! La Perla hotel has conceived some customised offers for who wants to stay in Ancona, close to Ancona Sud exit toll. Stop in Ancona, stay in the brand new and modern hotel’s bedrooms. Find out our comfort, cordiality and convenience. Stay in Ancona, in our hotel starting from 30€ per person! Stay in Ancona, in our hotel double room at a convenient price! Breakfast included. 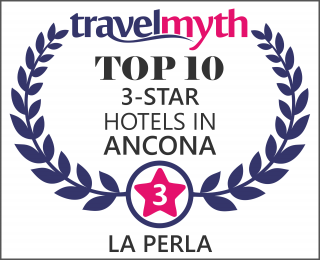 Stay in Ancona, in our hotel triple room at a convenient price! Breakfast included. Hotel Camerano AnconaAt a short distance from Ancona and Camerano industrial area, the hotel is ideal for people in business travel and in need of staying in comfortable rooms or have lunch choosing among the restaurant, the handy self-service or the bar. À la carte restaurantAfter years of experience with our bar-diner, we are happy to delight you with our à la carte restaurant! Delicious seafood recipes processed with local raw materials always respecting the local cuisine traditions. Starting point for the Conero Rivierathe marvellous beaches and the clear blue sea of the Conero Riviera are waiting for you at just 6km from our hotel. Don’t miss out the wonderful wild landscapes of the Conero coast! Shopping and outlets for everyone IKEA, Decathlon, shopping malls and a little bit further Tod’s, Prada and Paciotti outlets.. Ancona offers a wide range for shopaholics. Did the shopping make you hungry? Come try our restaurant! the hotel prices and offers!